On Friday January 18, five thousand students stayed home and several hundred teachers didn’t show up to work in Oakland. Oakland’s biggest high schools stood empty, as teachers called in sick across the district in a wildcat strike aimed at an intransigent school district leadership. 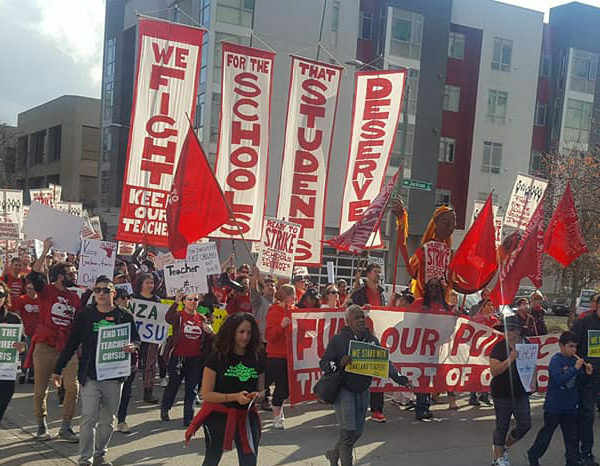 The unofficial one-day strike was a warning shot to the school board that Oakland’s teachers are ready for a full-on strike. The school district’s robocall warning to parents the night before the sick-out to send their kids to school fell on deaf ears. Parent and kids at home laughed out loud when the call began, “We value our students and teachers!” If this were true, this strike would not have been necessary. Hundreds of students, teachers, and parents rallied early in the morning at Oakland Technical High, where school doors were open for their 2,000 students, but none entered. Of the 1,500 students at Skyline High, less than 5% showed up. Some untenured teachers who showed up to school fearing reprisals saw the deserted campus and simply drove away, and many went to join the march. The Oakland Education Association did not openly endorse this illegal strike action. However, the leadership of this movement were the school reps and activists that are marching in line with the bold approach that the current OEA leadership demonstrates. Young teachers in Oakland survive on poverty wages while rents rise up around them. Picket signs of “Lowest Pay in the Bay” spoke to the crisis of teacher retention as neighboring districts offer much higher pay than Oakland. Students grinned and grabbed signs that said “Let’s Get that Bread”. But for teachers, who’re working without a contract, this is as much a fight for their students’ rights: for smaller class sizes, and more funding to Special Education and other resources. This frustration, and the inspiration of 32,000 striking LA teachers has energized this movement. The sea of red protesters marched downtown singing and chanting, “Oakland is a Union Town!” Construction workers waved, drivers honked and residents hung out of their windows applauding. Teachers are revered among working people, particularly parents. They work far too many hours and the Oakland School District (OUSD) has disrespected them far too long. As marchers arrived at the glass tower that houses the School Board, several teachers turned to each other to ask the same question: how much is the rent on this place? California is the richest state in the country, yet is 43rd in student spending. This crisis is especially accentuated in Oakland, where the Board has become a voice piece for the billionaires and their charter school movement. Tens of millions of dollars that should go into the classrooms instead feeds the army of consultants and administrators, and the privately-managed Charter Schools. “Chop from the Top” has become a popular slogan, as teachers, correctly, refuse to accept that the District is broke. The state of California is home to 144 barely-taxed billionaires and the richest 1% of any state, yet our schools remain neglected. The crowd outside District Headquarters was so big it blocked the street. Teachers banners were unfurled, megaphones blared and business as usual was off for the day. Oakland teachers will vote on strike approval in the coming weeks. The rising movement is a signal of which way that vote will go. But they are up against a serious foe, who are backed by the billionaires. The District’s unspoken goal to privatize education one inch at a time is going to take a lot to defeat. Unionized teachers are the big speed bump in the road to privatization. If Oakland teachers, parents and students can organize and unite and make a movement big enough to scare the hell out of the establishment, then we can win. The next few weeks will be critical. Today belonged to the 99%, to the students, parent and the teachers.